In 2015 we were asked to help with a complete refurbishment of a property needing some TLC in Battle, East Sussex. This luxurious project was actually completed by our Managing Director Dan Smith and his expertise came in very handy indeed. With more and more people inspired to ‘self-build’ it’s no surprise that even one of our suppliers wanted to get into the renovation game. Having worked closely with our friendly team for a number of years, they were super-confident we could handle the intricacies of their unique specifications. After purchasing a countryside home set in a large area of land, the client wanted to completely modernise the property. To keep the aesthetic on-trend, they wanted to create sliding glass doors that would allow them to open up space for glamourous get-togethers. For this project, Dan recommended selecting the Smart Visofold 1000 bi-folding doors with corner post and Smart Visoglide Plus sliding doors. These particular products would help the client achieve his vision. And once we powder coated all the ground floor items in the increasingly popular RAL7038 matt shade, they complemented the lovely timber windows featured throughout the property too. Once installation began, it was clear that this project would be unique. The corner where the bifolds meet is inverted, normally the corner is the outermost point. On this job it is the innermost point. This meant the clients were able to able to open up the whole corner of the house, making for a striking feature. The main motivation for the client was to create a stunning space for their loved ones to enjoy themselves. 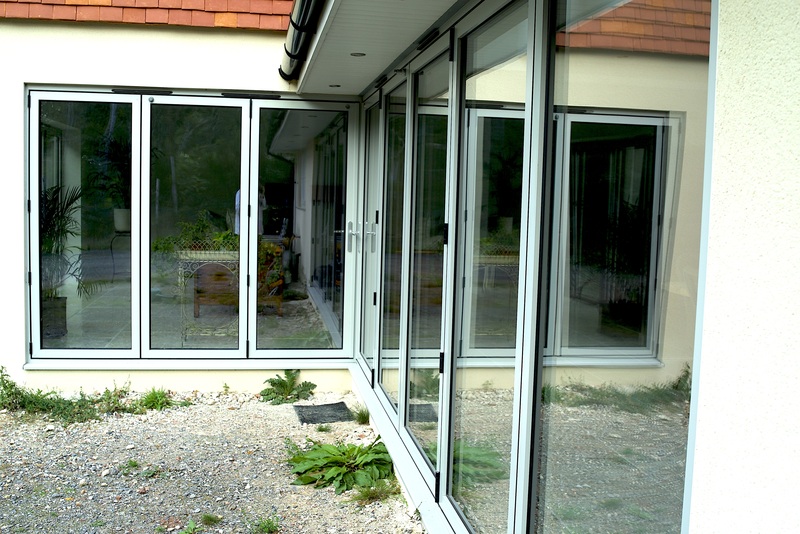 To make sure guests could come and go with ease, we suggested a combination of 5 panes and 3 panes bi-folding doors in order for them to able to have a ‘traffic door’ on both sets of bi-folds. A traffic door is the single door on the end that allows someone to enter and exit easily without opening the rest (creating a nuisance for other guests). The traffic door can then slide the same way as all the other panes should they want to open them all up. This allows the clients to completely open up the space, and means guests can explore the rest of the property without dealing with cumbersome, clunky framing. The client was very pleased with the end result – and so were the installation team. The easy-to-use, aesthetically pleasing doors are a great edition to the property. They allow the client to connect home to garden during fabulous parties – at any time of year. A great result.